"we are losing money" discount. Why? Because we have new yarns coming in each day and we need the room. I know. That sounds like a cheesy car commercial. Maybe I should put on a crazy sheep costume and do a singing and dancing ad. 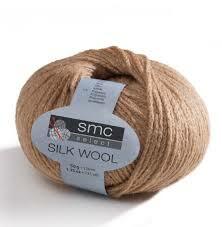 This lovely little number features 120m/131yds of 64% virgin wool, 27% silk, and 9% polyamid. It comes in 8 lovely colors (although we can't guarantee how long that will last). There's a subtle sheen to this chain-like yarn which will knit up light and airy. This would make lovely sweaters, scarves and shawls. Now be aware. Once our extremely limited stock is gone, it's gone. We will not be bringing more in. You can't special order more. We do not guarantee that it will be here when you come (the lady just before you might buy all on hand). All sales are final. So don't hem and haw too long over this. And no tantrums if it's all gone when you get here.